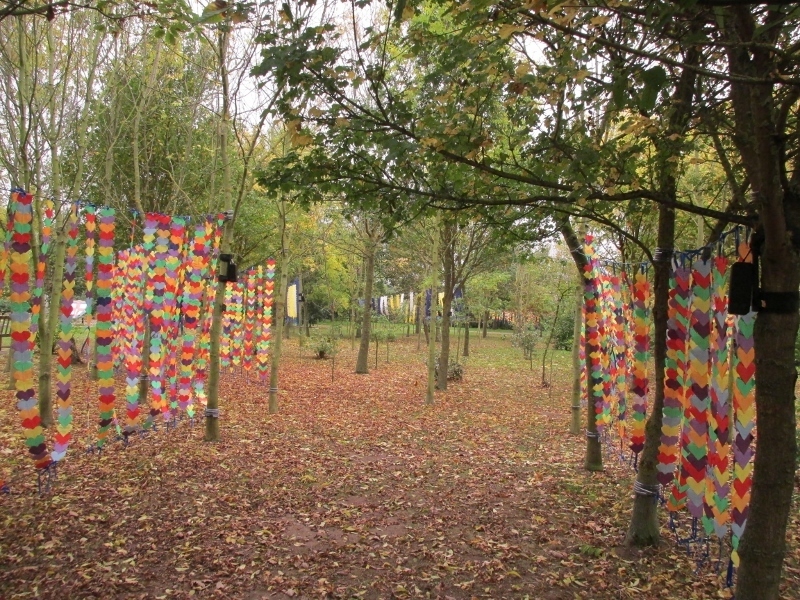 A moving and colourful large-scale art installation is gradually taking shape in Staffordshire to help commemorate the hundreds of thousands of soldiers who fought and died in the bloody Battle of Passchendaele during the First World War. The inspirational National Memorial Arboretum, situated at Alrewas, near Lichfield, has been marking the centenary of Passchendaele, which lasted from 31 July 1917 to 10 November 1917, in partnership with The Royal British Legion. And among the projects to commemorate the conflict in the vicinity of the village of Passchendaele, where British forces suffered an estimated 270,000 casualties, is the Heartfelt Messages art installation progressively being created within the War Widow's Wood in the Arboretum's grounds close to the new main Visitor Centre. The installation, designed by artists Nicola Colclough and Naja Bagi, uses traditional paper folding techniques and sound to capture the 'heartfelt messages' exchanged between troops at the front line and their loved ones back home in England. People can either write their own message or finish a suggested choice of sentences such as 'To the person I miss the most I want to say'.....or 'My most heartfelt message to a loved one is...'. 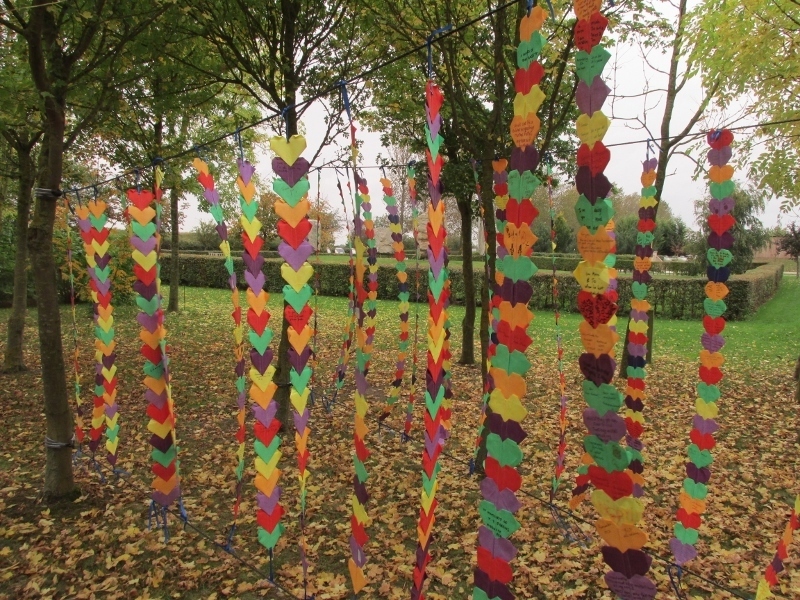 Inspired by the millions of letters sent between the trenches and home during World War One, the multi-sensory installation will eventually comprise of more than 20,000 messages, housed in colourful origami hearts, each of them individually created by members of the public. 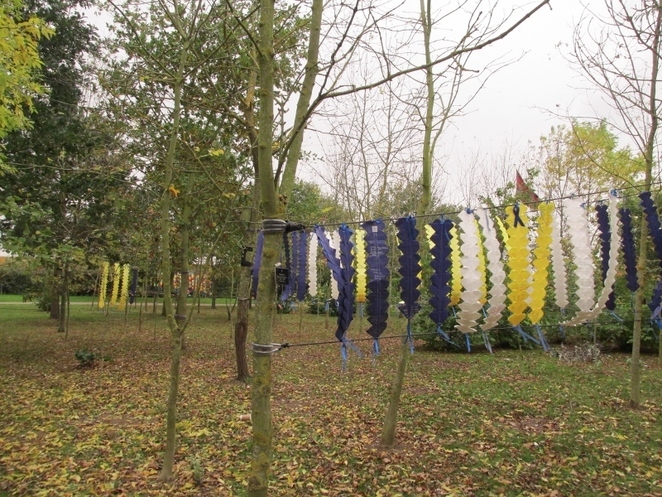 The project officially began on July 31, marking the start of the Battle of Passchendaele, but the streams of message-filled hearts have only recently between attached onto several wire canopies which have been erected among a group of trees within the Arboretum. Visitors to the National Memorial Arboretum will continue to be able to contribute to the installation up until November 10. But as well as the visual contribution using paper, visitors can also record their own personal messages to add to the audio tapes which will be broadcast throughout the length of the project on radios dotted in among the art installation. 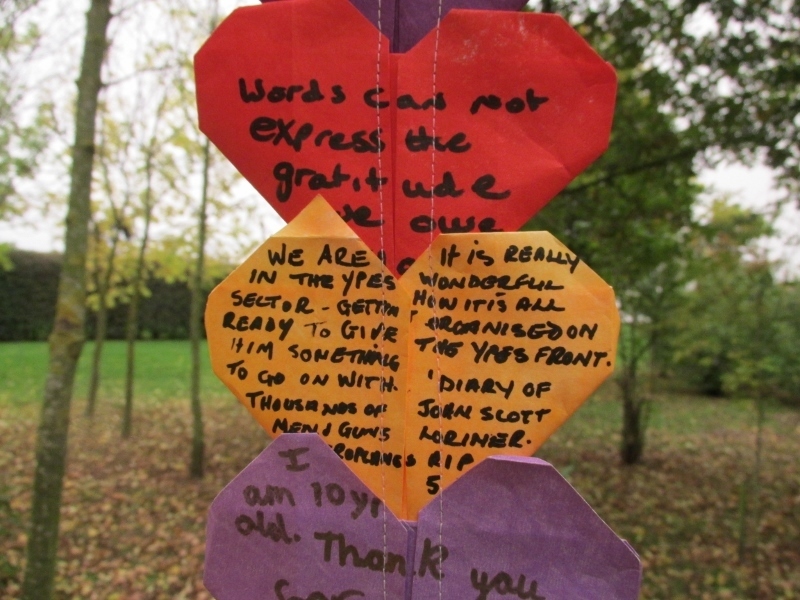 It certainly makes for a moving accompaniment when viewing the hundreds of messages that have so far been displayed among the trees. The messages will continue to be displayed at the Arboretum throughout the Battle of Passchendaele commemorations, during which they are likely to be seen and read by thousands of visitors to the memorial site. The National Memorial Arboretum is home to more than 300 memorials, including the Armed Forces Memorial, dedicated in the presence of Her Majesty the Queen, which carries the names of all servicemen and women who have died while on duty since the end of the Second World War. Other major landmarks include the Far East Prisoners of War Memorial Building, the Basra Memorial Wall, and the Shot at Dawn memorial commemorating the 306 British and Commonwealth soldiers shot for cowardice or desertion during WWl.